“Distributed Information-Theoretic Metric Learning in Apache Spark,” Yuxin Su, Haiqin Yang, Irwin King, M.R. Lyu, in Proceedings of the 2016 International Joint Conference on Neural Networks (IJCNN 2016), Vancouver, Canada, July 24-29, 2016. “What You Say and How You Say it: Joint Modeling of Topics andDiscourse in Microblog Conversations,” Jichuan Zeng, Jing Li, Yulan He, Cuiyun Gao, M.R. Lyu, Irwin King, Transactions of the Association for Computational Linguistics. (TACL), accepted. “Multi-Head Attention with Disagreement Regularization,” Jian Li, Zhaopeng Tu, Baosong Yang, M.R. Lyu, Tong Zhang, in Proceedings of the 2018 International Conference on Empirical Methods in Natural Language Processing (EMNLP 2018). “Online Non-negative Dictionary Learning via Moment Information for Sparse Poisson Coding,” Xiaotian Yu, Haiqin Yang, Irwin King, M.R. Lyu, in Proceedings of the 2016 International Joint Conference on Neural Networks (IJCNN 2016), Vancouver, Canada, July 24-29, 2016. “CBRAP: Contextual Bandits with RAndom Projection,” Xiaotian Yu, Michael R. Lyu, Irwin King, in Proceedings of the 31th AAAI Conference on Artificial Intelligence (AAAI 2017), San Francisco, California USA, February 4–9, 2017. “Assessing the Security Properties of Software Obfuscation,” Hui Xu, and Michael R. Lyu, IEEE Security & Privacy Magazine, vol.14, issue.5, 2016, pp.80-83. “Benchmarking the Capability of Symbolic Execution Tools with Logic Bombs,” Hui Xu, Zirui Zhao, Yangfan Zhou, and M.R. Lyu, IEEE Transactions on Dependable and Secure Computing. (TDSC), accepted in 2019 for publication. “SpyAware: Investigating the Privacy Leakage Signatures in App Execution Traces,” Hui Xu, Yangfan Zhou, Cuiyun Gao, Yu Kang, and Michael R. Lyu, in Proceedings of the 26th International Sysposium on Software Reliability Engineering (ISSRE 2015), Washington DC, USA, November 2-5, 2015. “INFAR: Insight Extraction from App Reviews,” Cuiyun Gao, Jichuan Zeng, David Lo, Chin-Yew Lin, M. R.Lyu, Irwin King, in Proceedings of the 26th ACM Symposium on the Foundations of Software Engineering (FSE 2018 demo track), Florida, United States, November 4-9, 2018. “Online App Review Analysis for Identifying Emerging Issues,” Cuiyun Gao, Jichuan Zeng, M.R. Lyu, Irwin King in Proceedings of the ACM/IEEE 40th International Conference on Software Engineering Companion (ICSE 2018), Gothenburg, Sweden, May 27-June 3, 2018. “PAID: Proritizing App Issues for Developers by Tracking User Reviews Over Versions,” Cuiyun Gao, Baoxiang Wang, Pinjia He, Jieming Zhu, Yangfan Zhou, and Michael R. Lyu, in Proceedings of the 26th International Sysposium on Software Reliability Engineering (ISSRE 2015), Washington DC, USA, November 2-5, 2015. “Towards Automated Log Parsing for Large-Scale Log Data Analysis,” Pinjia He, Jieming Zhu, Shilin He, Jian Li, and M.R. Lyu, IEEE Transactions on Dependable and Secure Computing. (TDSC), (accepted in 2017), vol.15, no.6, 2018, pp.931-944. “Characterizing the Natural Language Descriptions in Software Logging Statements,” Pinjia He, Zhuangbin Chen, Shilin He, M. R.Lyu, in Proceedings of the 2018 ACM/IEEE International Conference on Automated Software Engineering (ASE 2018), Montpellier, France, September 3-7, 2018. “Learning to Log: Helping Developers Make Informed Logging Decisions,” Jieming Zhu, Pinjia He, Qiang Fu, Hongyu Zhang, M.R. Lyu, and Dongmei Zhang, in Proceedings of the ACM/IEEE 32nd International Conference on Software Engineering (ICSE 2015), Florence, Italy, May 16-24, 2015. “A Privacy-Preserving QoS Prediction Framework for Web Service Recommendation,” Jieming Zhu, Pinjia He, Zibin Zheng, and M.R. Lyu, in Proceedings of the 22nd IEEE Conference on Web Services (ICWS 2015), New York, USA, June 27–July 2, 2014. “Overlapping community detection with preference and locality information: a non-negative matrix factorization approach,” Hongyi Zhang, Xingyu Niu, Irwin King, and M.R. Lyu, Social Network Analysis and Mining. (SNAM), 8, no.1(2018):43. “Modeling the Homophily Effect between Links and Communities for Overlapping Community Detection,” Hongyi Zhang, Tong Zhao, Irwin King, M.R. Lyu, in Proceedings of the 25th International Joint Conference on Artificial Intelligence (IJCAI 2016), New York City, USA, July 9–15, 2016. “Dependability Issues of Android Games: A First Look via Software Analysis,” Jiaojiao Fu, Yangfan Zhou, and Yu Kang in proc. the 2015 International Workshop on Internet based Virtual Computing Environment (IVCE 2015), San Francisco, USA, 2015. “Gradient Boosting Factorization Machines,” Chen Cheng, Fen Xia, Tong Zhang, Irwin King, and M.R. Lyu, in Proceedings of the 8th ACM Conference on Recommender Systems (RecSys 2014), Silicon Valley, USA, October 6-10, 2014. “Where You Like to Go Next: Successive Point-of-Interest Recommendation,” Chen Cheng, Haiqin Yang, M.R. Lyu, and Irwin King, in Proceedings of the 23rd International Joint Conference on Articial Intelligence (IJCAI 2013), Beijing, China, August 3-9, 2013, pp. 2605-2611. “Online QoS Prediction for Runtime Service Adaptation via Adaptive Matrix Factorization,” Jieming Zhu, Pinjia He, Zibin Zheng, and M.R. Lyu, IEEE Transactions on Parallel and Distributed systems. (TPDS), vol.28, issue.10, 2017, pp.2911-2924. “Service-generated Big Data and Big Data-as-a-Service: An Overview”, Zibin Zheng, Jieming Zhu, and M.R. Lyu, in Proc. 2nd IEEE International Congress on Big Data, Santa Clara, CA, USA, June 27-July 2, 2013, pp. 403-410. “Combinatorial Pure Exploration of Multi-Armed Bandits”, Shouyuan Chen, Tian Lin, Irwin King, M. R. Lyu and Wei Chen, in Proceedings of Advances in Neural Information Processing Systems (NIPS 2014) (Oral Presentation), Quebec, Canada, December 8 - 12, 2014. “Exact and Stable Recovery of Pairwise Interaction Tensors”, Shouyuan Chen, M.R. Lyu, Irwin King, and Zenglin Xu, in Proceedings of the Annual Conference on Advances in Neural Information Processing Systems (NIPS 2013), Nevada, USA, December 5-8, 2013, pp. 1691-1699. “Test Selection for Result Inspection via Mining Predicate Rules,” Wujie Zheng, M.R. Lyu, and T. Xie, in Proceedings of the 31st International Conference on Software Engineering (ICSE 2009), New Ideas and Emerging Results, Vancouver, Canada, May 2009, pp. 219-222.
Business Analyst, Citinet Systems Ltd.
“Localized support vector regression for time series prediction,” Haiqin Yang, K. Huang, I. King, and M.R. Lyu. Neuocomputing, vol. 72, iss. 10-12, 2009, pp. 2659-2669. [July 27, 2009] A social game “Page Hunt” developed by Hao Ma at Microsoft showed up on MIT Technology Review (Related news). “Two-Stage Multi-Class AdaBoost for Facial Expression Recognition,” Hongbo Deng, Jianke Zhu, Michael R. Lyu and Irwin King. In Proceedings of International Joint Conference on Neural Networks (IJCNN 2007). Florida, USA, Aug.12-17, 2007. “Efficient Convex Relaxation for Transductive Support Vector Machine,” Z. Xu, R. Jin, J. Zhu, I. King and M.R. 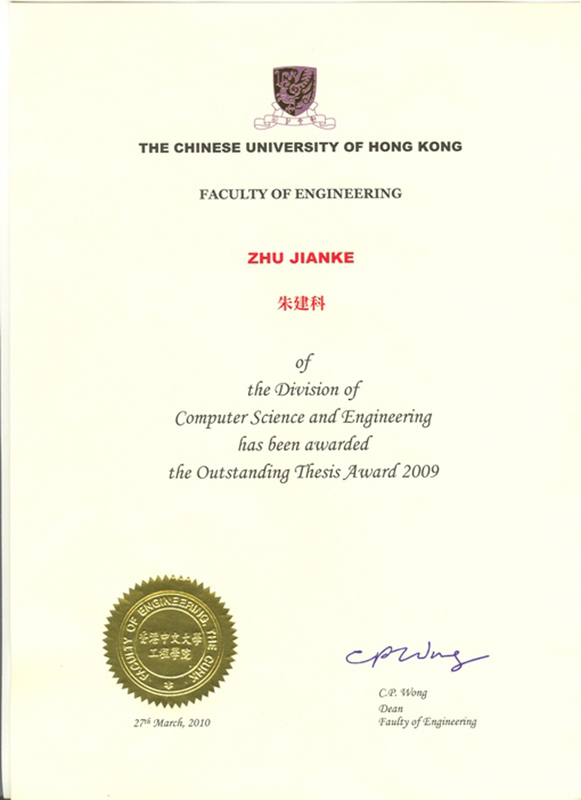 Lyu, Advances in Neural Information Processing Systems (NIPS'2007), 2008. “An Empirical Study on Reliability and Fault Correlation Models for Diverse Software Systems,” X. Cai and M.R. Lyu, Proceedings 15th International Symposium on Software Reliability Engineering (ISSRE’2004), Saint-Malo, France, November 2-5 2004. “Pseudoinverse Learning Algorithm for Feedforward Neural Networks,” P. Guo and Michael R. Lyu, in Advances in Neural Networks and Applications (NNA '01), N.E.Mastorakis Eds., WSES Press (Athens), pp.321-326, 2001. “Software Quality Prediction using Mixure Model with EM algorithm,” P. Guo and Michael R. Lyu, in Proceedings of the First Asia-Pacific Conference on Quality Software (APAQS 2000), ed. by TSE & CHEN, pp69-78, Hong Kong, October 30-31, 2000.